Feb 09, 2017 After a tumultuous election season, can small business owners expect some certainty and stability heading into 2017? Apr 2018 What do business tradelines mean? Scottsdale, Ariz., May 22, 2018 — Experian®, at its 37th annual Vision Conference, today announced it has become a certified vendor of the Small Business Financial Exchange, Inc. (SBFE), a nonprofit trade association that gathers and aggregates small-business payment data in the United States to help organizations build a complete picture of small business. As a SBFE Certified Vendor, Experian can combine its rich data — including traditional and alternative business data and consumer data on business owners — with SBFE’s data to provide the most comprehensive view of a small business in the market today. For example, financial institutions looking for broad and deep insights on small and emerging businesses will be able to find that information in a way no one has offered previously. Also for the first time, Experian clients that are nonfinancial institutions, such as e-commerce, communications, insurers, and software and hardware vendors, can qualify to access this financial data to help them make confident credit decisions by gaining deep visibility into a small business’s capital use and credit history through Experian. Experian fosters a culture of continuous innovation, from the way it works to the solutions it creates. The company plans to deploy its data scientists to apply leading-edge techniques, including machine learning and artificial intelligence, to discover and provide predictive insights and analytical tools to support better decisioning for its clients. It is anticipated that the work of its data scientists on the combined data sets will result in new product launches over the next 24 months. Each year, Vision combines in-depth research, cutting-edge technology and expertise from industry leaders to help Experian’s clients strengthen their balance sheets and plan for sustained growth. The 2018 conference sold out and runs May 20â€“23 in Scottsdale, Ariz.
Experian is the world’s leading global information services company. During life’s big moments — from buying a home or a car, to sending a child to college, to growing a business by connecting with new customers — we empower consumers and our clients to manage their data with confidence. We help individuals to take financial control and access financial services, businesses to make smarter decisions and thrive, lenders to lend more responsibly, and organisations to prevent identity fraud and crime. The Small Business Financial Exchange, Inc., and SBFE, LLC (collectively known as SBFE) is the country’s leading source of small-business credit information. Established in 2001, this nonprofit association’s database houses information on more than 32 million businesses and enables information exchange among members who provide small-business financing. Through its resources and relationships, SBFE makes possible innovative risk management solutions by providing industry insight and analysis of aggregated small-business financial data to its Members. SBFE is the only Member-controlled organization of its type and is serving as the most trusted advocate for the safe and secure growth of small business. For more information, visit www.sbfe.org. After a tumultuous election season, can small business owners expect some certainty and stability heading into 2017? Latest Main Street Report reveals a confident lending market composed of strong balance growth and low delinquency rates that position 2017 as a strong year for small-business credit. Costa Mesa, Calif., Feb 09, 2017 — While it is still too early to say how the Trump administration will effect small business owners, for now the outlook of lenders and business owners appear to be stable and somewhat optimistic, based on overall credit performance. Experian®, the leading global information services company, and Moody’s Analytics, a leading independent provider of economic forecasting, today announced that while small-business credit utilization rates remain flat from the previous quarter, credit balances expanded broadly and drove down delinquency rates to reveal a healthy lending market. The latest Experian/Moody’s Analytics Main Street Report reveals a positive finance market based on key factors from Q4 2016, which measure the overall health and well-being of the small-business sector. According to the report, the fourth quarter was defined by an increased willingness to lend, as results show a spike in total loan balance growth: a 7.7 percent increase from the third quarter and a 10.3 percent increase year over year. Despite the balance growth, utilization rates among small businesses remain just under 40 percent, leaving plenty of capacity for small-business owners with current available credit. In a true testament to the improving economy, two of the hardest-hit industries over the past few years — mining and transportation/utility — are quickly showing signs of improvement. Following OPEC’s announcement of supply cuts in late November of last year, oil prices ticked up, which has had a positive impact on the mining and transportation industries. The fourth quarter showed a sharp decline in delinquencies, falling 43 and 116 basis points, respectively from the previous quarter. To get a copy of the latest Experian/Moody’s Analytics Main Street Report, visit www.experian.com/business-information/landing/msr-q4-2016.html. The full results of the report, as well as additional data and insights on small-business health, will be presented in a webinar on March 14 at 10 a.m. Pacific/1 p.m. Eastern. To register for the event or for more information, visit www.experian.com/business-information/landing/msr-q4-2016.html. Developed by Experian and Moody’s Analytics, the Experian/Moody’s Analytics Main Street Report brings deep insight into the overall financial well-being of the small-business landscape, as well as providing commentary about what certain trends mean for credit grantors and the small-business community as a whole. Key factors comprised by the Main Street Report include a combination of business credit data (credit balances, delinquency rates, utilization rates, etc.) and macroeconomic information (employment rates, income, retail sales, investments, etc.). Moody’s Analytics helps capital markets and risk management professionals worldwide respond to an evolving marketplace with confidence. The company offers unique tools and best practices for measuring and managing risk through expertise and experience in credit analysis, economic research and financial risk management. By providing leading-edge software, advisory services and research, including the proprietary analysis of Moody’s Investors Service, Moody’s Analytics integrates and customizes its offerings to address specific business challenges. Moody’s Analytics is a subsidiary of Moody’s Corporation (NYSE: MCO), which reported revenue of $3.5 billion in 2015, employs approximately 10,900 people worldwide and maintains a presence in 36 countries. Further information is available at www.moodysanalytics.com. We have 17,000 people operating across 37 countries and every day we’re investing in new technologies, talented people and innovation to help all our clients maximize every opportunity. We are listed on the London Stock Exchange (EXPN) and are a constituent of the FTSE 100 Index. Learn more at www.experianplc.com or visit our global content hub at our global news blog for the latest news and insights from the company. Costa Mesa, Calif., Nov 15, 2016 — As the busiest shopping season quickly approaches, small businesses everywhere are decking their halls and preparing to ring in the holidays. In honor of Small Business Saturday and Cyber Monday, Experian®, the leading global information services company, today announced a new Love My Small Biz program, offering small-business owners a free business credit report when they post a selfie with the hashtags #LoveMySmallBiz and #ShopSmall. To participate in this new program, business owners must tweet a selfie featuring their small business and include the hashtag #LoveMySmallBiz and #ShopSmall. Small-business owners who tweet selfies with these hashtags will be eligible to receive their free business credit report, which is valued at up to $49. The program will run through the end of the year, and the offer does not apply to existing SmartBusinessReports™ subscribers. For more information on the #LoveMySmallBiz program, please follow us on Twitter @ExperianSMB and Instagram @Experian_b2b. Experian’s Business Information Services is a leader in providing data and predictive insights to organizations, helping them mitigate risk and improve profitability. The company’s business database provides comprehensive, third-party-verified information on virtually all U.S. companies, with the industry’s most extensive data on the broad spectrum of small and midsize businesses. By leveraging state-of-the-art technology and superior data-compilation techniques, Experian provides market-leading tools that proactively support the entire credit life cycle, enabling our clients to find new customers, process new applications, manage customer relationships and collect on delinquent accounts. We are the leading global information services company, providing data and analytical tools to our clients around the world. We help businesses to manage credit risk, prevent fraud, target marketing offers and automate decision-making. We also help people to check their credit report and credit score and protect against identity theft. In 2016, for the third year running, we were named one of the “World’s Most Innovative Companies” by Forbes magazine. We employ approximately 17,000 people in 37 countries and our corporate headquarters are in Dublin, Ireland, with operational headquarters in Nottingham, UK; California, US; and SÃ£o Paulo, Brazil. To find out more about our company, please visit www.experianplc.com or watch our documentary, “Inside Experian”. Costa Mesa, Calif., Sep 15, 2016 — We know small business is the heart of the economy and part of the American Dream is to own a business. But just how successful is the average small-business owner compared with the average consumer? Experian®, the leading global information services company, today announced its Face of Small Business study, which examines key credit and demographic attributes of both groups to find out. Details from the study are available today in an infographic and will be presented in a webinar on Sept. 27 at 10 a.m. Pacific time/1 p.m. Eastern time. For more information, visit www.experian.com/thefaceofsmallbusiness. The report contains results from an analysis of data on a random sample of 2.5 million small businesses and 1 million consumers. Findings show that small-business owners outpace consumers when it comes to credit management. For example, the average personal credit score for a small-business owner is 721 — 48 points higher than the average consumer score of 673. Small-business owners also have a higher amount of available credit, with an average credit limit of $56,100; consumers have an average credit limit of $26,900. Debt load, however, also is higher for small-business owners, with the average total balance of all trades at $195,000 versus $96,000 for consumers. From a payment perspective, small-business owners have a higher monthly obligation as well, with an average payment of $2,032 compared with $954 for consumers. Despite these differences, only a relatively small percentage (5.9 percent) of small-business owners have one or more revolving bankcard trades that are 90-plus days beyond terms in the past 24 months compared with 7 percent of consumers. In terms of demographic characteristics, small-business owners are more likely to own a home and have a higher income than the average consumer. For example, the average income for small-business owners is $91,600 versus $70,400 for consumers. Also, 62 percent of small-business owners own a home compared with only 47 percent of consumers. Small-business owners tend to be a bit older and are more likely to have pursued higher education than the average consumer. The average age of a small-business owner is 56, and the average age of a consumer is 51. From an education perspective, 68.6 percent of small-business owners have attended some college and beyond, while only 53.5 percent of consumers have done so. For more information about this report or Experian’s other research on the small-business marketplace, please visit www.experian.com/thefaceofsmallbusiness. 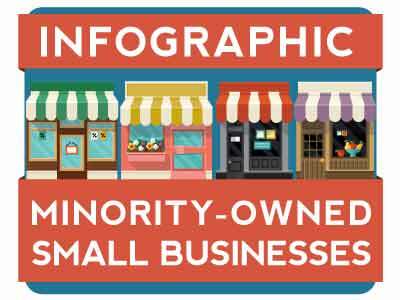 Costa Mesa, Calif., Mar 17, 2016 — As part of its analytical series on small businesses, Experian®, the leading global information services company, today announced a new study that offers insights into the health of minority-owned small businesses in the U.S. Findings from the study show that, compared with the overall small-business population, minority-owned small businesses are slightly behind when it comes to credit management. For example, the average business credit score* for a minority-owned small business is 49.7, nearly five points lower than the average for the general small-business population. As a consumer, the average credit score for a minority small-business owner is 707, 15 points lower than the overall average for small-business owners. In terms of payment behavior, 1.2 percent of minority small-business owners have at least one business credit card account that is severely delinquent (91-plus days), while 8.3 percent have at least one consumer credit card account that is severely delinquent (90-plus days). Comparatively, 1.1 percent of the general small-business owner population have at least one severely delinquent business credit card account and 6.8 percent have at least one severely delinquent consumer account. Experian’s analysis also identified the most popular industries for minority-owned businesses. The analysis shows that the industry of choice was eating places, which accounted for 7.3 percent of minority-owned businesses, followed by beauty shops (5.8 percent), legal services (2.9 percent), business services (2.7 percent) and real estate (2.5 percent). Regardless of industry, the analysis found that the average consumer income for these business owners is $92,489. This is similar to the general small-business owner population, which has an average consumer income of $92,338. From an education perspective, 65.6 percent of minority small-business owners have at least some college experience, just slightly less than the general business population (68.3 percent). BusinessCreditFacts.com — an authoritative source for understanding and learning about the benefits of managing business credit. Experian Business Credit — a site that enables small-business owners to access a copy of their business credit report and helps them understand the impact maintaining a positive credit profile can have on a small business. Business Score Planner™ — an education tool for business owners to understand how financial plans and changes to commercial credit information can impact a business credit score. The analysis is based on a statistically relevant sampling of data from Experian’s consumer and business credit database from December 2015. Average scores are an average of the sample and are not representative of national consumer or small-business averages. Ethnic background was obtained from Ethnic Technologies, a provider of multicultural marketing data, ethnic identification software and ethnic data appending services. Costa Mesa, Calif., Feb 24, 2015 — Experian®, the leading global information services company, today announced new insights from a recent small-business analysis that showed small-business owners' payment behavior and credit management varies by gender. The analysis shows women business owners having a slightly lower commercial and consumer credit score than men. For example, the average commercial credit score for a woman-owned business is 34, while the average score for a male-owned business is 35. Similarly, the average consumer credit score for women business owners was 689 compared to male business owners at 699. In terms of payment behavior, the average number of days beyond contracted terms that male business owners pay their bills is 8.1 days, whereas women pay their bills 8.4 days past due. Experian's analysis also looked at the top 10 industries for male- and female-owned businesses. There were several industries that ranked in the top 10 for both genders, including business services, retail stores, building maintenance, restaurants, real estate and management consulting. Those specific to men were general contracting, motion-picture and video-tape distribution, general automotive repair and plumbing, while those specific to women were beauty shops; personal services; child day care; and gift, novelty and souvenir stores. Additionally, 48.3 percent of women business owners run their business out of their home, compared to 44.8 percent of male business owners. The analysis found that male-owned businesses experience higher sales than women-owned businesses. More than 24 percent of male-owned businesses have sales that exceeded $500,000, while only 14.5 percent of women-owned businesses see sales of that size. Furthermore, 21.2 percent of male business owners have a personal income of $125,000 or greater, compared to just 17.4 percent of women business owners. The analysis is based on a statistically relevant sampling of data from Experian’s consumer and commercial credit database from November 2014. The sample was based on a known business population where gender was identifiable. Average scores are not representative of national averages or a random national sample. Gender information was obtained from Experian Marketing Services. By leveraging state-of-the-art technology and superior data compilation techniques, Experian provides market-leading tools that proactively support the entire credit life cycle, enabling our clients to find new customers, process new applications, manage customer relationships and collect on delinquent accounts. We employ approximately 16,000 people in 39 countries and our corporate headquarters are in Dublin, Ireland, with operational headquarters in Nottingham, UK; California, US; and SÃ£o Paulo, Brazil. Mobile plays a growing role in how small businesses and its owners manage operations. To better address your needs on the go, we've built special technology to optimize the way you access your report through your mobile device. Whether you are using your computer, tablet or smartphone, you will experience screen and report accessibility sized accordingly to your device. No special mobile app downloads required — Simply browse or bookmark our site, begin searching and download reports from a new user-friendly interface. Through your mobile device, you will receive a readable version of your report showing a score, payment trends, public record counts and key business facts. Details of the report are offered through a single-click option to email you the PDF of the full report. 2014 was an eventful year: Republicans regained control of both the House and Senate in sweeping fashion, the European economy constricted dramatically, Russian economic sanctions brought the country to the brink of default, and China surpassed the United States as the world’s largest economy. And those are just a few of the year’s macro highlights. Yet despite this tumultuous time, the United States continued to demonstrate positive economic trends. As we look ahead, precarious global events and international uncertainties continue to raise some alarms, but domestic economic fundamentals appear strong enough to withstand external shock. In general, the U.S. economic recovery is on track to evolve into a full-fledged expansion. Bankcards on the rise: Overall, the nation’s credit scores are up and bankcard and retail card lending is growing, according to Experian’s State of Credit report. Specifically, the number of bankcards per consumer rose 4.2 percent from 2013, and the number of retail cards rose 6.7 percent, according to Experian. Consumer comfort zone for loans is back: Consumers are increasingly becoming comfortable taking out loans to purchase big-ticket items. Use of home-equity lines of credit grew amid a resurging housing market in 2014, and delinquency rates remained steady. New originations throughout the year totaled $120 billion — up 27 percent from the previous year. This growth trend is expected to continue through this spring and summer’s buying season. Auto loans and higher education benefit from recovery: Car and student loans are also seeing a rise. Open auto loan balances reached an all-time high, with the majority of loans/balances in the super prime credit range. And in an analysis of student loan trends since the 2008 recession up through 2014, Experian found that student loans increased by 84 percent, surpassing home equity loans/lines of credit, credit card and automotive debt. With the explosion of smartphones and digital tablets, marketers are seizing opportunities to reach key audiences in new ways, further strengthening America’s economy. Last year, 80 percent of marketers planned to run cross-channel marketing campaigns, and more than half planned to integrate their marketing campaigns across four or more different channels, according to Experian Marketing Services’ Digital Marketer Report. This fuels the economy by increasing the likelihood that consumers will make a purchase, as marketers can tailor offers to consumers’ specific needs. At the same time, it creates a strong need for data solutions to help marketers efficiently target their efforts. Ninety-three percent of companies have some sort of data-quality solution in place, Experian Data Quality found, but very few are calculating the return on this investment. Looking ahead, these businesses will need to calculate the return on their investments to document the economic value to their business — and we believe the outlook is strong for cross-channel marketing to continue to infuse energy into the American economy. Many of 2014’s big uncertainties were resolved after the first few months of the year. Initial stagnation turned out to be the result of inclement weather, and the delay of the Affordable Care Act’s employer mandate for small businesses allowed companies more time to prepare for greater employee health costs. But domestic uncertainties remain. Given their deep roots in the U.S. economy, consumer spending and the housing market will need to continue to pick up to successfully accelerate growth throughout 2015. Small businesses depend heavily on consumer spending to operate, and while household finances are trending at recovery highs amid stronger hiring and lower unemployment, compensation and hours worked actually fell last fall. At the same time, the housing market recovery is still not broad-based, leaving the construction industry in flux and certain regions lagging in growth. In New England, the market has remained stagnant, and in Florida and Illinois, where the housing crash was disproportionately detrimental, key industries such as construction are among the worst in the country. Meanwhile, in the Mountain West, population and job growth in lucrative fields have driven a housing boom and healthy credit economy. Despite pockets of stagnation and global challenges, the U.S. economy is poised to see a full-fledged expansion in 2015. As the labor market tightens, employers will raise compensation, freeing up discretionary consumer spending that will prove critical to sustained economic growth. All told, expect upward trends in the economy to continue as 2015 swings into high gear. Parker is group president, Credit Services, Experian North America. Find the perfect person for the job, then put the details in writing to be sure you're on the same page. Angie's List will connect you with contractors in more than 200 cities. The company says it monitors customer reviews for accuracy and offers discounts to users who select contractors that advertise on the site. Angie's fees vary, but in most cases you will pay $5 a month or $40 for an annual subscription. At ContractorCheck.com, you can scrutinize a builder's record, including bankruptcies, liens, insurance coverage and credit information ($13 for each report). Originally published in the May 2013 issue of Business Credit magazine, a publication of The National Association of Credit Management. Of the many ways for a company to be robbed, some are more harmful than others. While outright shoplifting and theft, sometimes referred to euphemistically as “shrinkage”, occurs in nearly every industry, stealing from a business is all the more painful when it loses its precious customers or dollars through deception. This deception takes many forms, but increasingly, the type of fraud causing small businesses the most damage is business identity theft. This report contains one or more tradelines. A tradeline (or trade payment) is a reported line of credit. You will need to purchase either the ProfilePlusSM Report or the Business Credit AdvantageSM Plan to see the tradeline(s).